In 1938, when radio had become widespread, thousands of Americans confused an adaptation of the H.G. Wells novel The War of the Worlds with a news broadcast and jammed police station telephone lines in the panicked belief that the United States had been invaded by Martians. It is difficult to imagine a radio broadcast causing comparably widespread misunderstanding today. In part this is because broadcasters have learned to be more cautious and responsible, in part because the media is a regulated industry, and in part because listeners have learned to be more savvy and sceptical. Moreover, the news industry itself is undergoing a transformation as the Internet offers multiple options to confirm or refute a breaking news story. But the Internet, like radio in 1938, is a relatively young medium. The notion that a tweet, blog or video posting could drive a similar public panic today is not at all far-fetched. The Internet remains an uncharted, fast-evolving territory. Current generations are able to communicate and share information instantaneously and at a scale larger than ever before. Social media increasingly allows information to spread around the world at breakneck speed. While the benefits of this are obvious and well documented, our hyperconnected world could also enable the rapid viral spread of information that is either intentionally or unintentionally misleading or provocative, with serious consequences. The chances of this happening are exponentially greater today than when the radio was introduced as a disruptive technology, despite our media sophistication. Radio was a communication channel of “one to many” while the Internet is that of “many to many”. The Internet does have self-correcting mechanisms, as Wikipedia demonstrates. While anyone can upload false information, a community of Wikipedia volunteers usually finds and corrects errors speedily. The short-lived existence of false information on its site is generally unlikely to result in severe real-world consequences; however, it is conceivable that a false rumour spreading virally through social networks could have a devastating impact before being effectively corrected. It is just as conceivable that the offending content’s original author might not even be aware of its misuse or misrepresentation by others on the Internet, or that it was triggered by an error in translation from one language to another. 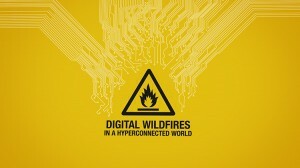 We can think of such a scenario as an example of a digital wildfire. How might digital wildfires be prevented? Legal restrictions on online anonymity and freedom of speech are a possible route, but one which may also have undesirable consequences. And what if the source of a digital wildfire is a nation state or an international institution? Ultimately, generators and consumers of social media will need to evolve an ethos of responsibility and healthy scepticism similar to that which evolved among radio broadcasters and listeners since the infamous War of the Worlds broadcast in 1938. This risk case asks if explicitly recognizing the potential problem and drawing attention to possible solutions could facilitate and expedite the evolution of such an ethos. From cuneiform to the printing press, it has always been hard to predict the ways in which new communication technologies will shape society. The scale and speed of information creation and transfer in today’s hyperconnected world are, however, historically unparalleled. Facebook has reached more than 1 billion active users in less than a decade of existence, while Twitter has attracted over 500 million active users in seven years. Sina-Weibo, China’s dominant micro-blogging platform, passed 400 million active accounts in summer 2012.1 Every minute, 48 hours’ worth of content is uploaded to YouTube. 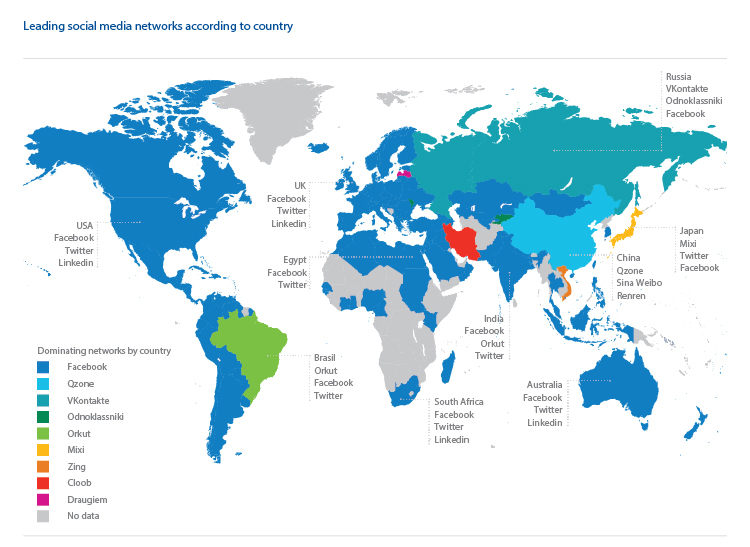 The world of social media is multicultural and young. 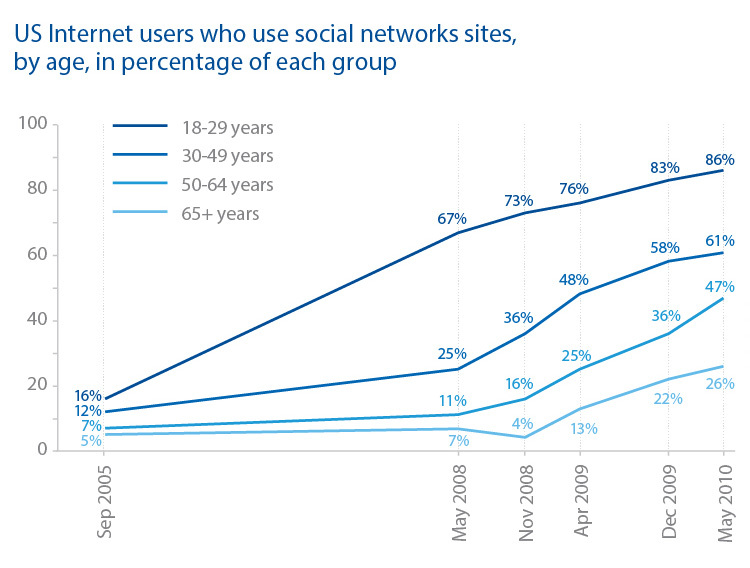 Figure 12 shows the preferences across the world for different social networking platforms, and Figure 13 illustrates the trends of social media use by age group in the United States. These are very different cases – a humorous response from a disgruntled customer, a defamation of character and an affront to religious sensitivities. What unites them is that hyperconnectivity amplified their impacts to a degree that would have been unthinkable in a pre-Internet age, when only a small number of large organizations had the capacity to broadcast information widely. This new reality has some challenging implications. These cases indicate one of the two situations in which digital wildfires are most dangerous: in situations of high tension, when false information or inaccurately presented imagery can cause damage before it is possible to propagate accurate information. The real-world equivalent is shouting “fire!” in a crowded theatre – even if it takes only a minute or two for realization to spread that there is no fire, in that time people may already have been crushed to death in a scramble for the exit. The other dangerous situation is when information circulates within a bubble of likeminded people who may be resistant to attempts to correct it. In the case of the Sandy NYSE tweet, other Twitter users rapidly posted accurate information and nobody had a vested interest in continuing to believe the original, false information.16 Cases in which false information feeds into an existing worldview, making it harder to dislodge, are far from unimaginable. This may be more of a problem with social networks where information is less publicly visible, for example, through friend networks on Facebook or more “opaque” social networks such as e-mail or text messaging.17 The spread of misinformation in such “trusted networks” can be especially difficult to detect and correct since recipients are more likely to trust any information originating from within the network. We should, therefore, not underestimate the risk of conflicting false rumours, circulating within two online bubbles of likeminded individuals, creating an explosive situation. The extensive use of Twitter by both sides during the November 2012 clashes between Israel and Hamas in Gaza18 points to the possibility of situations in which competing versions of events are propagated in self-reinforcing loops among groups of people who are predisposed to believe one side or the other and do not share a common information source that might help to dissipate some of the self-amplified information loops. More worrying for businesses may be misinformation that circulates at a time when markets are already anticipating an important announcement. On 18 October 2012, NASDAQ halted trading on Google shares as a leaked earnings report (coupled with weak results it entailed) triggered a US$ 22 billion plunge in Google’s market capitalization.26 In this case, the information was from a credible source, but it demonstrates impacts that could also be achieved by unfortunately timed misinformation or rumours. It is not always easy to trace the source of a digital wildfire. It would be possible for careful cyber attackers to cover their tracks, raising the possibility of an organization or country being falsely blamed for propagating inaccurate or provocative information. Depending on existing tensions, the consequences of the false attribution could be exponentially worse than if no attribution had been made. Establishing reasonable limits to legal freedoms of online speech is difficult because social media is a recent phenomenon, and digital social norms are not yet well established. The question raises thorny issues of the extent to which it would be possible to impose limits on the ability to maintain online anonymity, without seriously compromising the usefulness of the Internet as a tool for whistle-blowers and political dissidents in repressive regimes. When the incentives behind installing “quality” checks are questionable, who can be trusted? And how do you create an established and recognized authority that can intervene or disrupt misinformation flows when they happen? 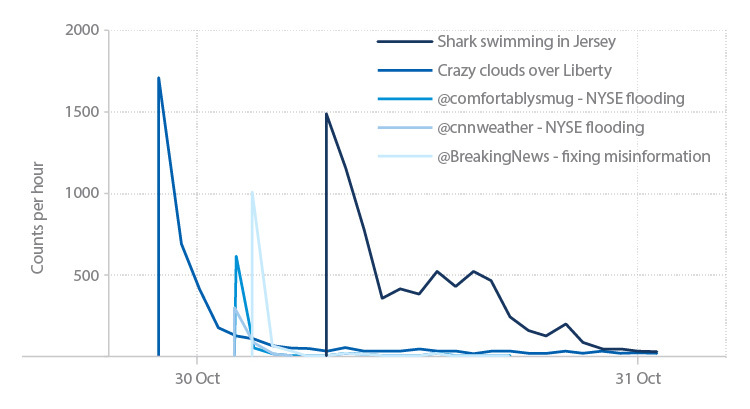 One can speculate that people may have been more willing to re-tweet the photos of sharks and the Statue of Liberty because they were harmless and surprising and, most important, had significant entertainment value. The entertainment value may also explain the lack of interest in circulating the correction tweets from @BreakingNews. People may have been less prepared to re-tweet information that could be tied to serious consequences, such as NYSE flooding, before verifying. This suggests that norms may be emerging, and also re-emphasizes the fact-checking responsibility of trusted sources of information such as CNN. Slips like this could one day be a litigation risk for media corporations. In addition to seeking ways to inculcate an ethos of responsibility among social-media users, it will be necessary for consumers of social media to become more literate in assessing the reliability and bias of sources. Technical solutions could help here. Researchers and developers are working on programmes and browser extensions, such as LazyTruth,33 Truthy34 or TEASE35, that aim to help people assess the credibility of information and sources circulating online. It is possible to imagine the development of more broad and sophisticated automated flags for disputed information, which could become as ubiquitous as programs that protect Internet users against spam and malware. Feedback ratings on eBay, which enable users to assess the reliability of vendors, offer a potential template for the development of such a service. Until now, most rating systems are limited to specific websites – users do not carry their rating with them as a record of credibility wherever they go online. It remains still to be seen if that would be a desirable or feasible model. Information disputed for ideological reasons or deliberate misattribution will continue to pose a number of challenges; however, a system could be developed that would trace information to its source and provide information on whether the source was considered by a broader community to be official. The system could also reveal how widely the source was trusted by a spectrum of other Internet users – all while protecting the identity of the source. It is not yet clear what a global digital ethos would look like, or how it could best be helped to develop. But given the risks posed by digital wildfires in our hyperconnected world, leadership is needed to pose these difficult questions and start the discussion. Controlling the spread of false information online, either through national laws or sophisticated technologies, raises sensitive questions on the limits to the freedom of speech – a human value that is not regarded or celebrated equally across different societies. How can constructive international discussions be started to define a global digital ethos without further polarizing societies on issues of civil liberties? What actions can be taken to promote a new and critical media- or information-literacy among the general public that raises individuals’ capacities to assess the credibility of information and its sources? Where should different groups of stakeholders look to verify the source of information online? How can different markers of trust and information quality be promulgated to facilitate greater user clarity? Across the globe, the rules of digital content are being formed: laws and policies written, cultural norms emerging, industry coalitions forming. In this dynamic environment, the disparate expectations and interests of the primary stakeholder groups – government, industry, and citizens – are intertwined, and often at odds. Any government policy or business strategy will need to take into account numerous interlinked factors to achieve desired outcomes and avoid unintended consequences. Develop an alternative framework to think about issues relating to digital media that start with intentions of stakeholders (e.g. reward innovation and make content accessible) rather than the actions taken (e.g. protect intellectual property) to arrive at a shared understanding and framework concerning issues such as freedom of expression, intellectual property and privacy in the digital universe. Account for differences in regional values and cultures and how they are reflected in the digital world, which is borderless. Explore the context and conditions needed for any government or business intervention to be effective and sustainable, showcasing some regulatory policies on intellectual property that may have seemed effective in the short term but too costly in the long term. Highlight cases of collaborative efforts among stakeholders or leadership of a specific group of organizations that can prove most successful, especially relating to technological innovation. The project is being led by media, entertainment and information industry partners from the publishing, social media and advertising industries, joined by regulatory bodies such as the Federal Communications Commission and the European Commission. Source: “#Sandy: Social Media Mapping”. Social Flow, http://blog.socialflow.com/post/7120245759/sandy-social-media-mapping, 2012. 1 “SINA Reports Third Quarter 2012 Financial Results”. SINA, http://phx.corporate-ir.net/phoenix.zhtml?c=121288&p=irol-newsArticle&ID=1759522&highlight=, 2012. 2 Howard,P.N., Duffy, A., Freelon, D. et al. "Opening Closed Regimes: What Was the Role of Social Media During the Arab Spring?” PITPI, http://pitpi.org/index.php/2011/09/11/opening-closed-regimes-what-was-the-role-of-social-media-during-the-arab-spring/, 2011. 3 “Twitter, Facebook and YouTube’s Role in Arab Spring (Middle East uprisings) [UPDATED 10/12/12]”. Social Capital Blog, http://socialcapital.wordpress.com/2011/01/26/twitter-facebook-and-youtubes-role-in-tunisia-uprising/, 2012. 4 Tumasjan, A., Sprenger, T.O., Sandner, P.G. et al. “Predicting Elections with Twitter: What 140 Characters Reveal about Political Sentiment”. Proceedings of the Fourth International AAAI Conference on Weblogs and Social Media, http://www.aaai.org/ocs/index.php/ICWSM/ICWSM10/paper/viewFile/1441/1852, 2010. 5 Asur, S., Huberman, B.A. “Predicting the Future with Social Media”. http://www.hpl.hp.com/research/scl/papers/socialmedia/socialmedia.pdf, 2010. 6 Jansen, B.J., Zhang, M., Sobel, K.et al. Twitter Power: Tweets as Electronic Word of Mouth. In Journal of the American Society for Information Science and Technology, 2009, 60(11): 2169-2188. 7 Ratkiewicz, J., Conover, M.D., Meiss, M. et al. “Detecting and Tracking Political Abuse in Social Media”. Proceedings of the Fifth International AAAI Conference on Weblogs and Social Media, http://www.aaai.org/ocs/index.php/ICWSM/ICWSM11/paper/view/2850/3274, 2011. 8 Berthon, P.R., Pitt, L. F., Plangger, K. et al. Marketing Meets Web 2.0, Social Media, and Creative Consumers: Implications for International Marketing Strategy. In Business Horizons, 2012, 55(3): 261-271. 10 O’Carroll, L. “Lord McAlpine to Demand Charity Donations for False Twitter Allegations”. The Guardian, http://www.guardian.co.uk/media/2012/nov/20/lord-mcalpine-false-twitter-allegations, 2012. 11 Sweney, M. “ITV to Pay Lord McAlpine £125,000 in Damages”. The Guardian, http://www.guardian.co.uk/media/2012/nov/22/itv-pay-lord-mcalpine-125000-damages, 2012. 12 “Egypt Newspaper Fights Cartoons with Cartoons”. CBS News, The Associated Press, http://www.cbsnews.com/8301-202_162-57520830/egypt-newspaper-fights-cartoons-with-cartoons/, 2012. 13 Keller, J. “How Truth and Lies Spread on Twitter”. Bloomberg Business Week, http://www.businessweek.com/articles/2012-10-31/how-truth-and-lies-spread-on-twitter, 2012. 14 Rodriguez, O.R. “Mexico Tweets Cause Massive Shootout Panic”. The Huffington Post, http://www.huffingtonpost.com/2012/09/08/mexico-tweets-panic_n_1866941.html, 2012. 15 Gowing, N. “Skyful of Lies and Black Swans. The New Tyranny of Shifting Information Power in Crises”, University of Oxford, Reuters Institute for the Study of Journalism, http://reutersinstitute.politics.ox.ac.uk/fileadmin/documents/Publications/Skyful_of_Lies.pdf, 2009. 16 Herrman, J. “Twitter Is A Truth Machine”. BuzzFeed, http://www.buzzfeed.com/jwherrman/twitter-is-a-truth-machine, 2012. 17 Keller, J. “How Truth and Lies Spread on Twitter”. Bloomberg Business Week, http://www.businessweek.com/articles/2012-10-31/how-truth-and-lies-spread-on-twitter, 2012. 18 Borger, J. “Israel and Hamas Deploy Twitter Feeds in Media War”. The Guardian, http://www.guardian.co.uk/world/2012/nov/15/israel-hamas-twitter-media-war, 2012. 19 Ratkiewicz, J., Conover, M.D., Meiss, M. et al. "Detecting and Tracking Political Abuse in Social Media”. Proceedings of the Fifth International AAAI Conference on Weblogs and Social Media, http://www.aaai.org/ocs/index.php/ICWSM/ICWSM11/paper/view/2850/3274, 2011. 20 Durden, T. “Fake Tweets About Syrian President Assad's Death Cause All Too Real Spike In Crude And S&P”. ZeroHedge.com, http://www.zerohedge.com/news/supposedly-fake-tweets-about-syrian-president-assads-death-cause-all-too-real-spike-crude-and-s, 2012. 21 “Fear Sparks Bangalore Exodus”. The Wall Street Journal, http://online.wsj.com/article/SB10000872396390443324404577595733604592276.html, 2012. 22 Biswas, S. “Social Media and the India Exodus”. BBC World News, http://www.bbc.co.uk/news/world-asia-india-19292572, 2012. 23 Moreno, K. “Social Media Risk Is Like Wildfire. Where's the Fire Engine?” Forbes, http://www.forbes.com/sites/forbesinsights/2012/08/07/social-media-risk-is-like-wildfire-wheres-the-fire-engine/, 2012. 24 Fournier, S., Avery, J. The Uninvited Brand. In Business Horizons, 2011, 54(3):193-207. 25 Reals, T. “Iran News Agency Picks up "Onion" Story, Tells Iranians Rural Americans Prefer Ahmadinejad to Obama". CBS News, http://www.cbsnews.com/8301-202_162-57522363/iran-news-agency-picks-up-onion-story-tells-iranians-rural-americans-prefer-ahmadinejad-to-obama/, 2012. 26 Efrati, A., “Google Hit by Weak Results, Shares Dive After Premature Report Shows Third-Quarter Profit Sliding 20%”. The Wall Street Journal, http://online.wsj.com/article/SB10000872396390443684104578064671358259436.html, 2012. 27 Bowcott, O. “Twitter Joke Trial: Paul Chambers Wins High Court Appeal Against Conviction”. The Guardian, http://www.guardian.co.uk/law/2012/jul/27/twitter-joke-trial-high-court, 2012. 28 Waters, R.,Thomas, D., Fontanella-Khan, J. “Fears Grow Over Efforts to Govern the Web”. The Financial Times, http://www.ft.com/intl/cms/s/0/7ff2be2c-3971-11e2-8881-00144feabdc0.html#axzz2EwLdUWHr, 2012. 30 Nakashima, E. “U.S. Refuses to Back U.N. Treaty, Saying it Endorses Restricting the Internet”. The Washington Post, http://www.washingtonpost.com/world/national-security/us-refuses-to-back-un-treaty-saying-it-endorses-restricting-the-internet/2012/12/13/ba497952-4548-11e2-8e70-e1993528222d_story.html, 2012. 31 Pfanner, E. “U.S. Rejects Telecommunications Treaty". The New York Times, http://www.nytimes.com/2012/12/14/technology/14iht-treaty14.html?_r=0, 2012. 32 Lotan, G. “#Sandy: Social Media Mapping”. Social Flow, http://blog.socialflow.com/post/7120245759/sandy-social-media-mapping#, 2012. 33 Streams, K. “LazyTruth Chrome Extension Fact Checks Chain Emails”. The Verge, http://www.theverge.com/2012/11/14/3646294/lazytruth-fact-check-chain-email, 2012. 34 “Truthy”. Indiana University, Bloomington, http://truthy.indiana.edu/, 2012. 35 “Tease: Trust Enabling Augmented-Reality Support for Information-Environments”. http://www.tease-project.info/, 2012.